On March 19th, The New York Times published “When Email Comes to the Doctor’s Office, Wait Times Decrease,” an in-depth overview of the history and benefits of e-consults by Austin Frakt, the director of the Partnered Evidence-Based Policy Resource Center at the V.A. Boston Healthcare System and professor at both Boston University’s School of Public Health and the Harvard T.H. Chan School of Public Health. In the article, Frakt highlights the health, cost, and satisfaction benefits of e-consult, citing a number of publications produced by members of the E-Consult Workgroup. Many thanks to our E-Consult Workgroup members for your tireless advocacy, education, and dissemination of information on the benefits of e-consults. E-consult is making headlines more and more often and becoming standard practice as a result of your efforts. Please join our next monthly call on March 28th for updates on this and other e-consult news. On February 26th, the University of Virginia Health System announced an expansion of six telehealth programs to improve both prevention and management of diabetes and heart disease. UVA’s e-consult program is one these six programs that will increase in capacity to provide patients across the state of Virginia with streamlined access to specialists. These expanded services will be funded by a grant from the Centers for Disease Control as well as the Virginia Department of Health. “Virtual care delivery models have proven to improve access, care coordination, clinical outcomes and patient engagement….Medicare now covers a broad range of virtual care models. Our collaboration with the CDC in advancing these connected care models to enhance disease prevention will impact patients across the nation.” said Dr. Karen S. Rheuban, director of the UVA Center for Telehealth. UVA’s e-consult program, one of five academic medical centers selected by the CORE program funded by a CMMI grant, was piloted in 2015 to improve access to endocrinology, cardiology, digestive health and neurology specialists. Since the program’s launch, referral rates have decreased, increasing specialist availability and saving time and money for patients. 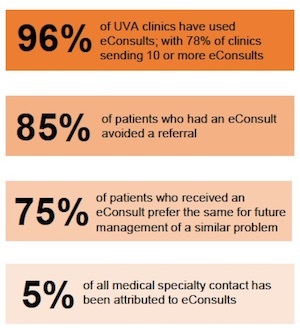 Among UVA’s clinics, 96% have used e-consults and 85% of patients who have had an e-consult did not need a face-to-face specialist appointment, as reported in a CORE case study. Geisinger, an integrated healthcare system located in central Pennsylvania, serves more than 2 million patients and employs approximately 500 primary care providers and 2000 specialists. Since January 2014, the system’s PCPs have had access to an e-consult system developed by Geisinger called Ask-a-Doc (AAD). New research evaluated AAD’s adoption by providers and impact on use, quality, and cost of care revealing that e-consult reduced costs for 14 medical specialties. All of Geisinger’s PCPs are trained to use AAD to send e-consults to medical specialists for addiction medicine, cardiology, comprehensive care, dermatology, endocrinology, hematology, infectious disease, laboratory medicine, nephrology, neurology, palliative medicine, psychiatry, pulmonary medicine, rheumatology, orthopedics, thoracic surgery, transplant surgery, urology, and vascular surgery. On January 28th, mHealth Intelligence published a 2000-word feature on e-consult’s benefits, the strength of its virtual care connections, and its ultimate ability to “prove…tenets of telemedicine.” In answer to the question “What is an econsult?”, e-consult is defined as a telemedicine platform that connects primary care providers with specialists improving care coordination and management. The article also reviews e-consults’ many additional benefits, including addressing current and future shortage of specialty providers, improving patient care quality, and increasing provider satisfaction. “As we face increasing demand alongside the shift to risk-based reimbursement models, a distinct advantage of this model is that it improves access, promotes high-quality care at lower costs, and increases satisfaction for providers and patients,” notes Scott Shipman, MD, MPH, and principal investigator of AAMC’s Project CORE e-consult collaborative. 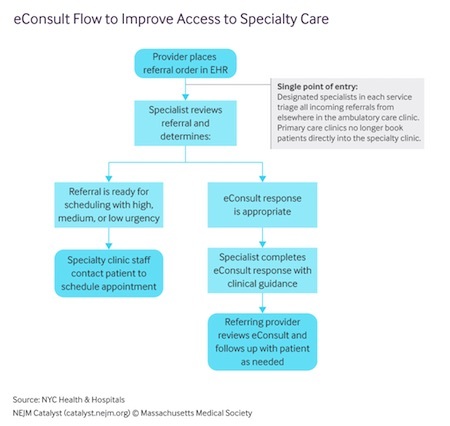 E-consults’ use for safety net patients by Connecticut’s Community Health Center Inc. is included an as example of how e-consult both improves clinical outcomes and is “adept at saving money.” These cost savings are linked to reimbursement policy shifts. While Connecticut is currently the only state that reimburses e-consults through its Medicaid program, California, Colorado, Oklahoma, and Washington are revising their Medicaid reimbursement policies to include e-consult. At NYC H+H, all specialty care referrals are submitted through the system’s electronic health record and then triaged by each clinic’s designated specialist. Each referral is either determined appropriate for an e-consult or scheduled for a high, medium or low urgency appointment. The specialty clinic then handles required appointment scheduling directly with the patient. Between January and September 2018, monthly e-consult submissions increased from 2,300 to 4,100 and participating specialty clinics increased from 29 to 81. After starting with clinics at two hospitals, e-consult is now in use by clinics at seven of the system’s hospitals. This period of significant growth has been overseen by NYC H+H’s president and CEO of Dr. Mitchell Katz who joined the system in January 2018 from the Los Angeles County Department of Health Services. 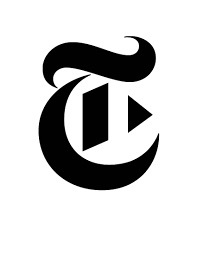 At the time, Katz stated plans to focus on primary care and expand the use of e-consult, reported The New York Times. A year later, in addition to eliminating many unnecessary face-to-face appointments NYC H+H has also decreased average wait times for in-person appointments from 50 days before e-consult to 28 days. “[I]n Los Angeles, we saw how successful an [e-consult] program can be in supplementing and strengthening primary care, and implementation here in the largest public health system in the country is recording similar success. We are pleased to expand our eConsult system to continue to improve access for our patients,” Katz commented to Healthcare Finance.